Like any American kid who grew up in the 90’s, I was a big fan of boxed Mac n’ Cheese. You could, in fact, classify me as a ‘connoisseur’ of it. My preference was for Kraft Thick and Creamy made with less milk so that it was extra powdered cheesy or if I was feeling decadent, Velveeta shells and cheese. For a long time, boxed Mac n’ cheese was my favored food from back home. I would have dreams of going to the grocery store and stocking up on it. On several occasions, I requested my mother send me care packages full of it because it was so hard to come by in Asia. For a long time, Mac n’ cheese from a box was the epitome for me of American comfort food. The sheer sight of the packaging alone would send me into a Proustian memory flashback of my childhood. No matter how old I became, I still turned to it for comfort time after time. Then one day, while discussing the merit of prepackaged processed foods and believing they would agree with me on the superiority of certain brands of Mac n’ cheese, my British friends just shrugged it off and remarked, ‘Meh, I don’t seem what all the fuss is about. It all tastes like cardboard! I can make a better version of it at home’. Now many reactions arise when a close friend says something as inflammatory as this statement was at the time. First was shock and denial, ‘No, you don’t understand because you didn’t grow up with it’. Then one day after opening a box at home and cooking it on my stove top, I came to the sad realization that yes, they were right. It’s true: IT DOES TASTE LIKE CARDBOARD! Not only that but it tasted like cardboard no matter what you did to it. Swap out the boxed macaroni for a different pasta? Still tastes like cardboard. Try a different brand? Cardboard. Mix flavor packets together? NOPE, tastes like salty cardboard. Cover everything is hot sauce-spicy CARDBOARD! In the end, I exhausted myself with experimentation and research. As a result of my burnout, I returned to the basics of simplicity and convenience. Now, I have limited my macaroni and cheese recipe down to just two recipes: creamy stove top or cheesy baked. 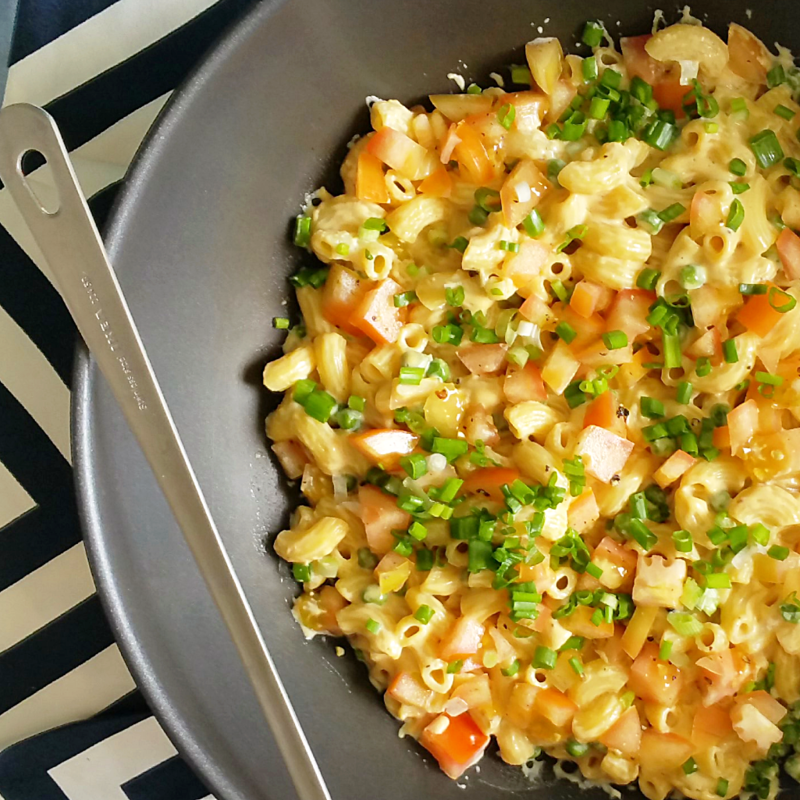 This recipe for stove top Mac n’ cheese exemplifies both simplicity and convenience. It’s a great recipe perfect for the busy caretakers out there who just can’t spend a lot of time in the kitchen but need to make a tasty favorite in one pot with a healthy amount of veg thrown in. It can be made in less than 20 minutes with little to no added flavorings, coloring, add preservatives, etc. and can be made as a quick meal for your small one(s) and you or as a quick and easy side dish because adults love this dish too. Bring water to boil in a large pot on the stove over high heat. Add pasta and frozen peas. Cook until al dente or until they are at the desired texture. Drain. In a medium to large saucepan, warm evaporated milk over medium heat. Add 1 tbsp of Dijon and a pinch of nutmeg and whisk to combine. When mixture starts to bubble, slowly whisk in the grated cheese a little at a time. Continue to whisk mixture for 2-3 minutes until fully incorporated in and sauce is creamy and cheesy. Turn heat down to low and continue to cook until thick and bubbly (about 2-5 min). Turn off heat and stir in pasta and peas. Top with chopped tomatoes and scallions or crispy onions any other kind of veg you enjoy. Put the kids to work! One of the reasons why I think I cook today is because my mom put me to work in the kitchen when I was young. Give them a job suitable to their skills like grating cheese, beating batter, peeling potatoes, or setting the table. Cooking with your kids is a great way to teach children about nutrition and food. Also, they will more likely eat it if they take pride in helping to make it. If your child is not a big fan of peas or tomatoes, no problem. Try with a different veg and see if that works. You can add green beans or broccoli to the mix, try out a crumbly cauliflower crust, or put some pumpkin or squash puree to the sauce. Include your child into deciding what vegetable you should add and try letting them pick it out at the market. If the vegetable is something they haven’t tried before, make sure they do a taste test ahead of time.